Rolling-element bearings are some of the most frequently used mechanical components that require a lubricant. Their application is very broad, ranging from small, non-critical knob-adjuster support bearings to large, critical wind-turbine main bearings. In general, bearings tend to fail well before their design life. This is often because the environmental and operating factors are not controlled or taken into consideration when the lubricant is selected. In this article, I will refer to rolling-element bearings simply as bearings. However, this does not necessarily address the topic as it relates to journal bearings. Regardless of whether a bearing reaches its design life, the life you should strive to achieve from your bearings should be based on the optimum reference state (ORS). When considering a bearing’s application and its associated reliability objectives, a certain maintenance strategy should be deployed to help attain an optimized return on investment. 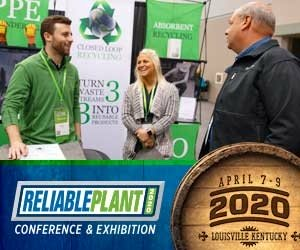 For example, if the result of a bearing failure does not lead to any immediate downtime and the corrective action costs are insignificant when compared to using regular proactive and predictive maintenance over the life of the bearing, then a run-to-failure strategy may be the ORS. It’s not uncommon for small bearings (with low speed factors) to be kept sealed without any relubrication and very little maintenance required. However, in most cases, a carefully selected relubrication schedule and a maintenance strategy that is more comprehensive than simply reactive maintenance will be recommended, depending on the optimum reference state. To what type of application is the bearing subjected? With the answers to these questions, a risk/priority number can be calculated and recommendations for the best maintenance strategy determined. 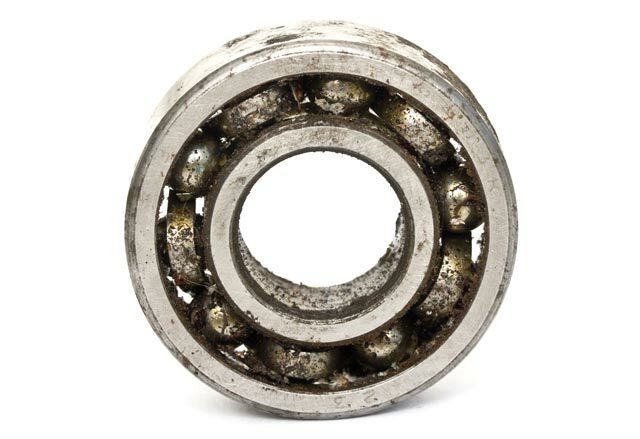 This article will highlight the most common failure mechanisms for a bearing as a result of lubrication (or lack thereof). When analyzing these failure mechanisms, one can perform a lubricant FMEA. 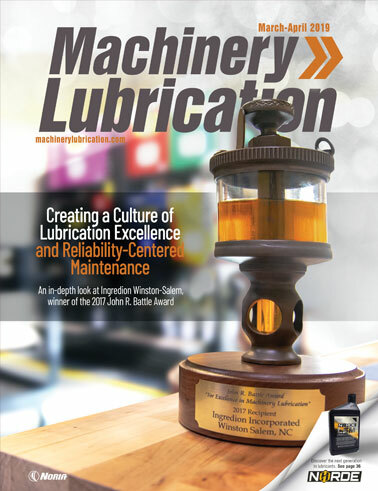 With this approach, questions are asked similar to those in the machine FMEA discussed earlier, but in this case the lubricant’s failure root causes are identified as well as how they can result in a failure to provide lubrication to the machine. In his book, Machinery Failure Analysis and Troubleshooting Vol. 2, Heinz Bloch states, “Lubrication-related bearing problems, according to our experience, are most frequently caused by lack of lubrication or lubricant contamination.” This information is not new and has been reiterated by bearing manufacturers and end users through countless failure root cause analyses (FRCA). But why? Consider that rolling elements in bearings ride on a thin film of lubricant (often less than 1 micron) at the mating surface of the bearing race. With small contact areas, the pressure exerted on the surfaces can exceed 500,000 pounds per square inch (psi). If any lubricant is displaced by a foreign contaminant, such as dirt or water, at these critical load zones, the bearing eventually will experience increased wear. If the wear is excessive, the life of the bearing will be reduced significantly. The result is a contamination-induced bearing failure. But even when contamination is minimized, if the lubricant selected for the application does not meet the operating and environmental requirements, a lubricant-​induced bearing failure will occur. First, you must choose the correct lubricant for the application. Fundamental properties, such as the viscosity, additive package and consistency (for grease), should be carefully selected based on the bearing type, speed factor and operating conditions. If these factors are not thoroughly considered and an unsuitable lubricant is applied, the lubricant may become overly stressed or be insufficient for the machine’s lubrication needs. In either situation, the bearing will likely undergo premature wear and failure. For greased bearing applications, the correct regreasing volume and frequency must be established to ensure the bearing load zones are lubricated properly. Too much time between regreasing intervals or applying too little grease will cause excessive boundary conditions and bearing wear. This type of failure mechanism also tends to trigger a chain reaction of other failure mechanisms, such as hot running conditions, and generate wear particles, further perpetuating the failure mode. Even in oil applications, routinely monitoring the oil level can mean the difference between optimal lubrication and no lubrication. More grease is not always better. 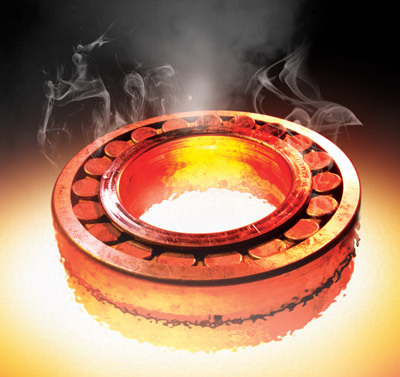 When too much grease is added to a bearing in medium to high-speed applications, the temperature will rise from the churning, and the machine must work harder to overcome the fluid friction. As the temperature rises for the excessive grease charge, the viscosity will drop and other adverse effects will ensue. A bearing running at a higher than expected temperature can be either a root cause or a symptom. If the bearing is exposed to an external environment that is exceptionally hot, this would indicate a root cause. If the temperature increase is from an internal condition, then this would be a symptom with possible root causes such as excessive lubricant, lack of lubricant or misalignment. Regardless of the source of the hot running conditions, the heat will lead to increased lubricant oxidation, thermal degradation, additive depletion, viscosity changes and other failure modes. If the source of the higher temperatures is mechanical, this can be identified as part of the FMEA process. Solid contaminants can enter a system in a number of ways, including through a new lubricant, ingested from a headspace port or hatch, via defective seals, etc. The type of solid contaminants can vary depending on the source, but typical airborne dust/dirt will consist primarily of silica and alumina. Excessive contamination will result in lubrication failure, as the lubricant likely will not be able to overcome the various wear modes, like three-body abrasion. Additionally, if the contaminants are metal catalysts, they can contribute to lubricant degradation in the form of oxidation, particularly when in combination with water, higher temperatures and air. Similar to solid contaminants, moisture can enter a system in many different ways, including through the headspace entry point, seals or new oil. When the headspace is humid, thermal cycles can cause moisture to escape the air, sweat onto surfaces and find its way into the oil through gravity. Moisture may exist in a lubricant as dissolved, emulsified or free water. Emulsified water has the most destructive potential in oil. Water is not a good lubricant, so when it displaces oil in a bearing’s load zones, the water collapses, producing a lubrication failure and mechanical wear. Water also contributes to oxidation and hydrolysis, with the lubricant undergoing permanent chemical degradation and additive depletion. These can lead to a lubrication failure by changing the lubricant’s viscosity, removing additive functionality, and forming other contaminants, insolubles and acids. Of course, when considering the machine, water is the primary cause of rust. Topping up (if oil) or regreasing (if grease) a bearing with the wrong lubricant can drastically change the physical and chemical properties of the resulting lubricant mixture. 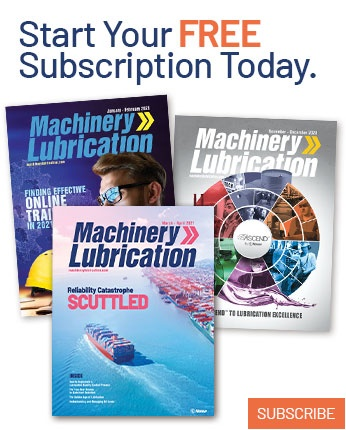 Not only can factors like the wrong viscosity impact lubrication, but additives can also react negatively with each other, impeding their functionality. Depending on the machine type, bearings may be introduced to other process chemicals, blow-by contaminants, glycol, etc. Based on the type of contaminant, the lubricant can change chemically or physically, resulting in a lubrication failure. In conclusion, regardless of whether you have a lubricant- or contaminant-induced failure mechanism, the result will either lead to lubrication failure modes or contribute directly to mechanical failure modes of the bearing. When multiple failure mechanisms are combined, there is greater potential for a lubricant failure. A machine FMEA performed on a failed bearing can frequently reveal mechanical wear signatures that indicate whether the failure was lubricant-related, although often the damage during the final stages of a catastrophic failure will destroy or overshadow the evidence of the failure’s true root cause. In these cases, it usually is best to perform lubricant analysis (either grease or oil) to detect clues of the root cause, like a thermally degraded lubricant, abnormal levels of contaminants, changes in viscosity, etc. When developing a conclusion, it also helps to include available maintenance records or condition monitoring data, such as vibration analysis, thermography or maintenance logs on relubrication and inspections. Again, just because a lubrication failure has occurred doesn’t necessarily mean the lubricant was insufficient in volume. Many failures are associated with too much of something, like the lubricant’s viscosity or amount. Moreover, if a contaminant is taking the place of the lubricant or disrupts the function of the lubricant, the contaminant will be the ultimate cause of the lubrication failure. Troyer, D. (2000, May). “FMEA Process for Lubrication Failures.” Practicing Oil Analysis. Bloch, H.P. (1999). Machinery Failure Analysis and Troubleshooting. Vol. 2. pp. 79.